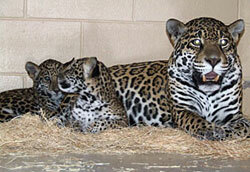 Jaguar Cubs Born at the Zoo! This updated photo was taken in early February. 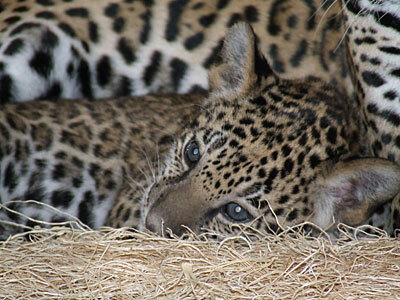 The Milwaukee County Zoo is excited to announce the recent birth of two jaguar cubs. On December 13, visitors were able to see the cubs for the first time on a live video stream showing in the Florence Mila Borchert Family Big Cat Country. (The cubs do have access to a nest box, and at certain times, it may be more difficult to see them in the video.) The last time the Zoo displayed jaguar cubs was 1975. The two cubs were born November 13 to first time mother, Stella, and father, Pat. Zookeepers continue to monitor Stella and her cubs in an area not visible to the public, mainly via video feed, and report the cubs are nursing, sleeping, and even hissing and scratching. They will nurse until about 5 to 6 months of age, and begin to sample meat at about 5 weeks of age. This birth is significant in that the cubs’ father, Pat, is a rescued, wild-born animal and considered a founder to the population. Pat not only brings new genes to the captive jaguar population, but serves as an ambassador to the wild population and to the conservation of the species. At approximately 14 years old, Pat has adapted extremely well to his Zoo surroundings; and now has the added success of siring offspring.